The Big 12 Conference has the reputation of being a very competitive conference. This year, that may not be the case. With last year’s season ending in very dramatic fashion with two in-state rivals deciding the league champion in Oklahoma and Oklahoma State, many want the same type of competition this season as well. In the last few weeks of the 2015-2016 season, four of the 10 conference teams were in league championship talks and college football playoff talks as well. This year, things don’t look quite the same. With one of those four teams (TCU) losing their Heisman-caliber quarterback, things don’t look quite as promising and with another Texas team (Baylor) happens to be dealing with some internal problems that hurt this team drastically and could end in some pretty steep penalties by the Big 12. Assuming the bottom half of the league will remain about the same, considering no major breakthroughs occurred during the offseason, that only leaves three of four teams in contention to win a Big 12 championship this year with one of them being a team that no one seems to be able to critique. There’s no knowledge of what they can necessarily do as a complete unit. This year may just end a lot like last year if things go as planned, but in regular Big 12 fashion, things don’t ever seem to go as expected. Here are some pretty bold predictions for the 2016-2017 season. David Beaty took the head coaching job last year knowing that the Jayhawks were a project team. Not sure if he expected the team to go (0-12) on the season with one of the teams they lost to being South Dakota State, a member of the FCS. That loss pretty much set a narrative for this team last season were no one thought they’d make any noise. They will return 12 starters this season, plus the Beaty has one year of heartbreak out of the way. Although this team will fail to have a winning record this year, they do hope to win one or two games and maybe, just maybe they’ll win a conference game as well. The most obvious reason this team didn’t perform at any kind of competitive level last season was because they lost their top three quarterbacks for the season. With Ryan Willis injuring his wrist in spring practice, things don’t seem like they are turning in their favor. Willis should win the starting job, but unfortunately based on him completing 52 percent of his passes, but throwing 10 interceptions and only 9 touchdowns in the last eight games of the season, he won’t be able to compete against the tougher quarterbacks in the league. This is a team that has a chance to shock some people, but they probably won’t. They’d have a chance to go to a bowl game in another conference, but in the Big 12 conference where they have one of the toughest schedules in all of the CFB, that leaves them out. However, like former coach Paul Rhoades said while packing his bags, this team should make a bowl game by 2016. Unfortunately, that didn’t happen due to a ton of injuries that didn’t happen last season, but his point still stands. If this team remains healthy throughout the season, don’t be surprised if they have at least a .500 record and make a bowl game. 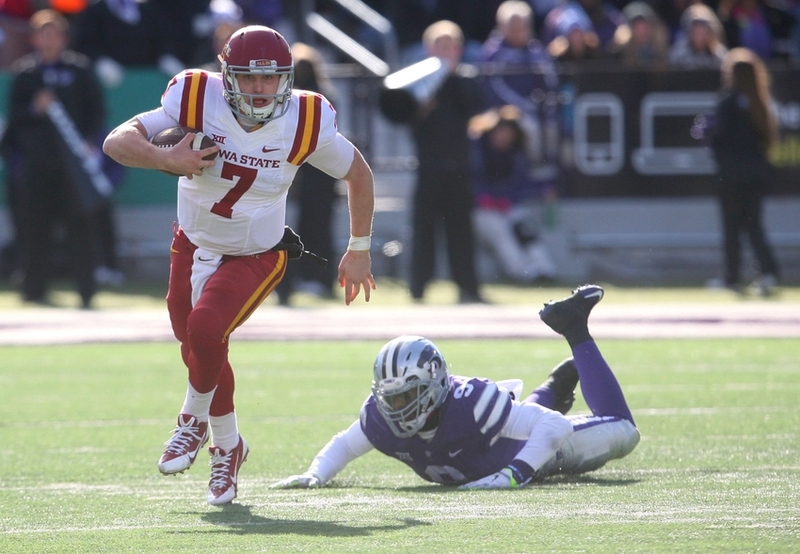 The Cyclones don’t lack talent, specifically throughout their skill positions. They have top four or five talent in the conference, but they haven’t been able to translate that into wins. Maybe changing the offense will help things for this young team. They primarily run the ball but have very talented young receivers. Head coach Matt Campbell has three things on his side that sets up a recipe for success in the future, though. The respect of his players, a terrific fan base supporting the entire team, and one of the top recruiting classes. Don’t expect this team to be in the doghouse for too long. In 2015-2016 the Kansas State Wildcats failed to make a bowl game for the first time since 2005 under head coach Bill Snyder. That was partially due to injuries, just like Iowa State. 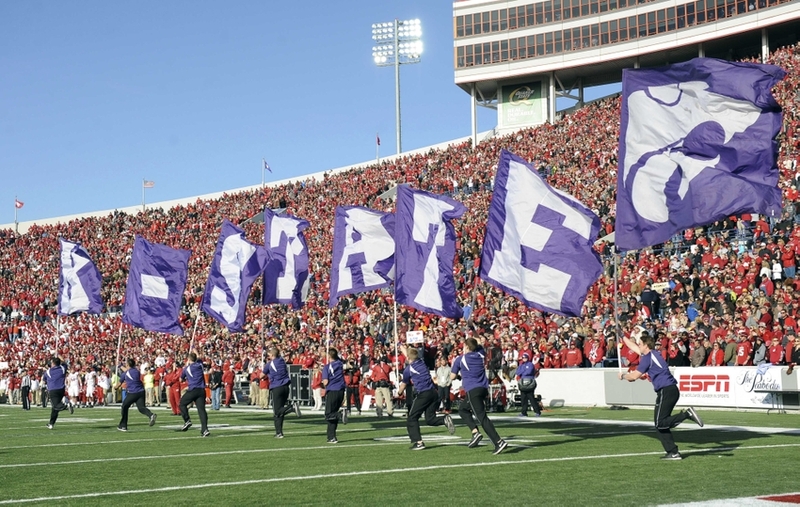 Coach Snyder’s teams are always tough opponents and respected. They aren’t always the best team on paper but seemingly, they surpass expectations. Even last year where they were only one game out of a bowl game (6-7). The defense will be as stout as ever, returning key players in Elijah Lee, Will Geary, and Jordan Willis. Last season, the quarterback situation wasn’t ideal. They lost their starting and backup QB to injury for the season and were forced to implement the services of former walk-on Joe Hubener, a player that was the backup passer on his high school team. All things considered, he overachieved by winning six games last season. Defensively, they should be back on track. Last year’s secondary was expected to be great, but once again injuries turned that ‘great’ defense to one of the league’s worst. They return in 2016-2017 a better defense with their veteran leadership healthy. The only reason they will only win six and not seven or eight games this season is due to a very tough schedule, starting with Stanford. Texas Tech looks like the same team we’ve all witnessed for so many years. They don’t have nearly as much talent as they’ve had in past years, but they have a pretty solid offense. 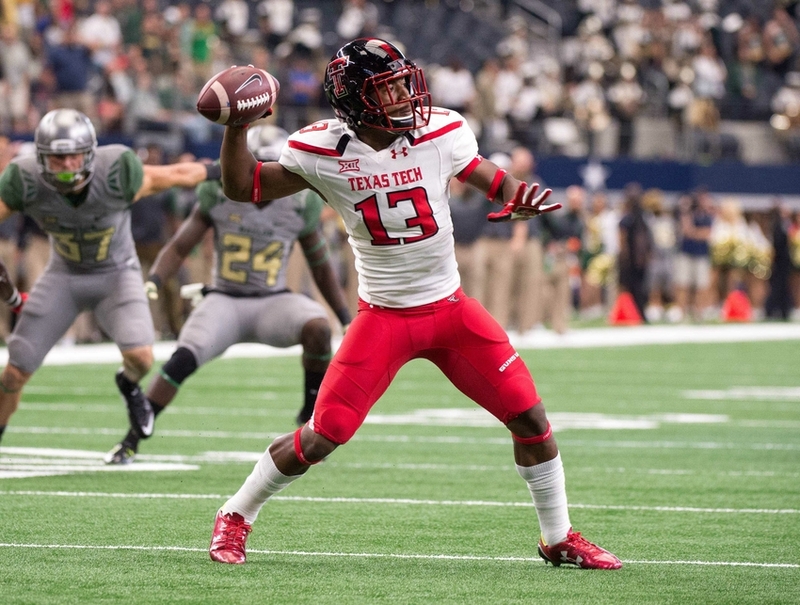 It all starts with Patrick Mahomes – who is arguably a top two or three quarterback in the conference. They also have a strong veteran receiving core. There are competitions at running back and receiver. Justin Stockton is the front-runner at running back. He’s a human highlight reel waiting to happen. Tech just acquired a junior college transfer in Derrick Willies and will return Dylan Cantrell who spent significant time injured last season. They have strength at the slot position in Cameron Batson, Ian Sadler, and De’Quan Bowman. With a top three conference quarterback throwing to those guys in Patrick Mahomes, this offense looks powerful once again. Defense…is a different story. Remember, this is your typical Texas Tech team; great offensive firepower with lackluster defense. David Gibbs’ defense set records last year as one of the league’s worst. The Red Raiders gave up the most points (43.6 ppg) in school history, and a Big 12-worst 279.9 rushing yards allowed per game. With that poor of a defense, it’ll be scary watching them play against top offenses. The defense is why this team isn’t in the upper half of the Big 12. With West Virginia being hundreds of miles east of the entire Big 12 it’s harder for teams to really scout them sometimes…especially during the offseason. That holds true for the Big 12 media as well. 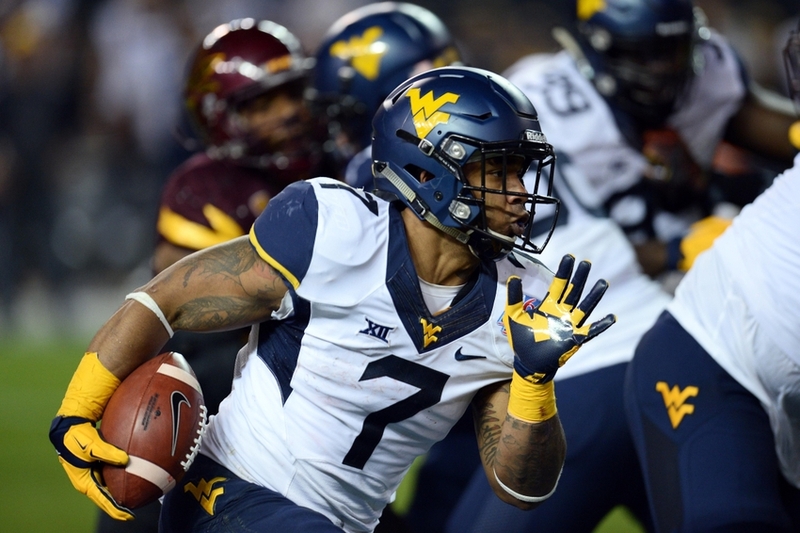 There’s a lot we don’t know about but on the surface, the Mountaineers look like a top offense in the conference. That’s never been their problem in the Big 12. Quarterback Skylar Howard and a returning, a powerful offensive line will propel this team over the lower portion of the conference into the middle portion. The defense will feature a new look. They’ve lost eight starters and will have to put inexperience in the most powerful offensive conference. This is something that will affect the outcome of this season for West Virginia. They will pull out eight wins, purely off their offensive abilities, but if this new defense folds, the number of wins could drop, dramatically. Actually, with head coach Dana Holgorsen’s job presumably on the line, everyone will be on pins and needles all season and if the defense fails to perform, this team will be anxious about coach’s future. Baylor University. As many know, there are some serious things happening on campus that has stirred up a lot of controversy since May 26. With that being said, I’m not sure how much energy and attention will be put towards the actual season. Head coach Art Briles lost his job, in response to sexual assault allegations. Baylor’s journey to the top of the Big 12 took no time at all, primarily because of Briles’ work. He’s gone now, and so are many other university officials. This time last year, this team was a top-tier team. Up until the rise of Oklahoma and Oklahoma State late last season, Baylor was the favorite to win the Big 12 and in prime position for a playoff birth. Two quarterbacks are coming back from surgery and the receiving core is very inexperienced. So, the offense that almost became iconic last year won’t hone the firepower they once did. 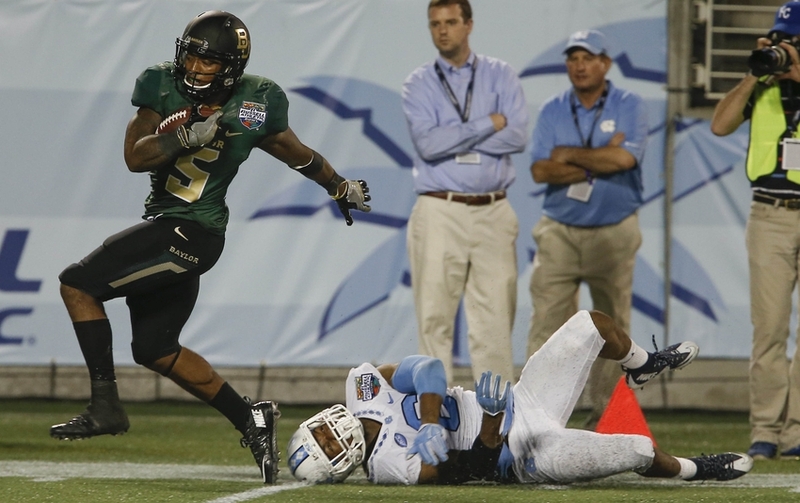 Provided, this team still has a lot of firepower on offense, how will they respond to new head coach Jim Grobe? The players really liked Briles, and now he’s gone and a new coach is in place. Chemistry may be an issue. 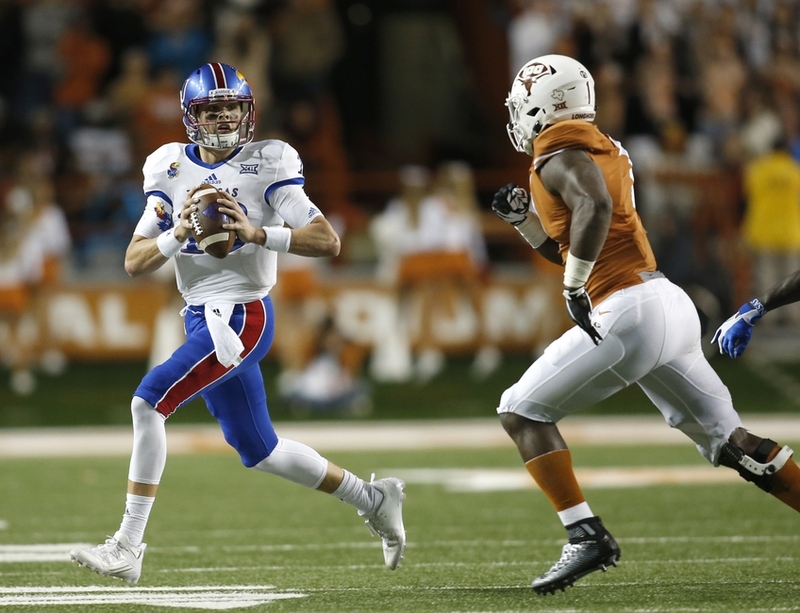 This is a team that could potential be as high as second in the Big 12, but will they? Probably not. There are too many problems surrounding this university right now. This may be the surprise of the conference. A team that underachieved last year under head coach Charlie Strong has a lot of pressure on them now, in order to keep Strong on campus. Many media members have this team six or seventh in the conference this year, but this year, we will see the Longhorns improve due to what’s at stake now. Signing a few blue-chippers, offensive coordinator Sterlin Gilbert looks to implement them in the offensive gameplan instantly and get production out of them. The uncertainties come from the offensive end. It’s a bit of a mystery. We don’t know what they are going to do in the quarterback department for sure and that’s obviously a huge part of things running smoothly. 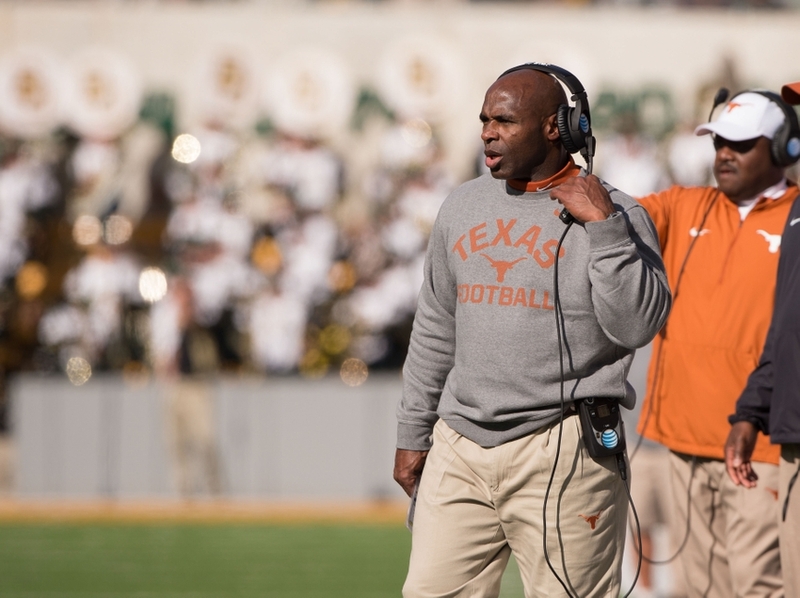 However, defense wins championships and although this team won’t win any championships this year, but the defense, mixed with their urgency for success will surprise the Big 12 and college football and Charlie Strong will keep his occupation. Oklahoma State went 10-3 under head coach Mike Gundy last season, while only being one game away from winning the Big 12 Title. Unfortunately, they lost to in-state rival Oklahoma and the hopes to squeak in the playoffs went down the drain. This year, they look very similar to last year’s team, which can be good and bad. Offensively, they are returning nine starters, those nine starters last season helped earn a No. 22 ranking nationally last year in that department and 14th in scoring. 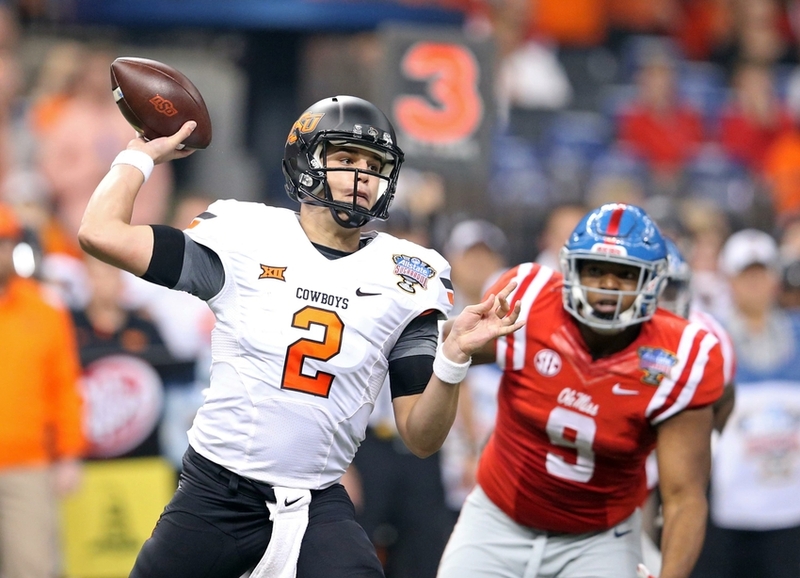 Mason Rudolph is a hidden gem, a quarterback that still hasn’t received all the praise he deserves. Last season he passed for 3,770 years and 21 touchdowns. Partly because he has outstanding receivers like James Washington, who racked up 1,087 receiving yards and 10 touchdowns on 53 receptions. Those stats make him the leading returning receiver in the Big 12 this season. The only question offensively is the running game that suffered last season. Will it improve? If so, they’ll easily be in Big 12 Championship talks. Although they lost their biggest defensive weapon in Emmanuel Ogbah, Gundy believes the defensive foundation will support this team and continue to move forward. TCU lost one of the best quarterbacks in all of college football last season in Trevon Boykin, but the offense is so powerful, they shouldn’t hurt too much. Since the horned Frogs switched to an Air Raid offense, they’ve won 23 of 26 games, so they’ll probably stick with that style. The also lost top receiver Josh Doctson as well. 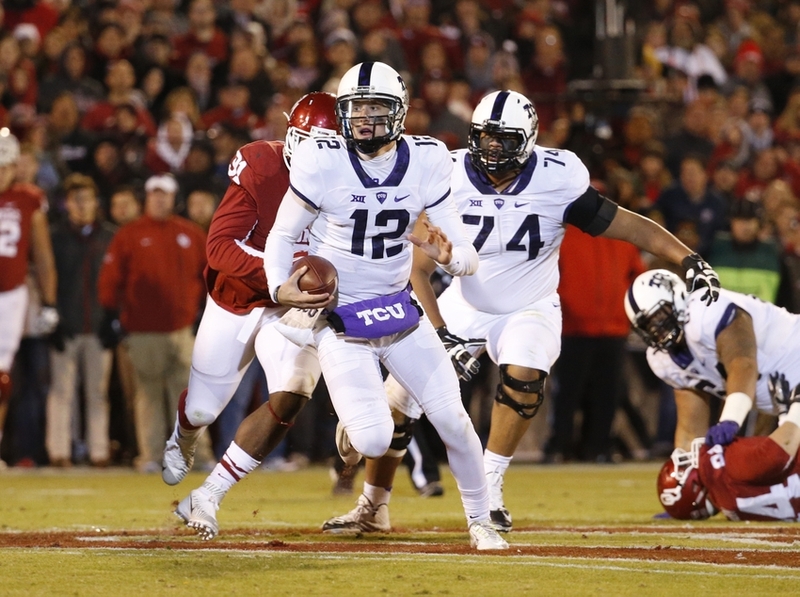 Will Kenny Hill or Foster Sawyer be the next quarterback of this offense? Whoever it is, there will be pressure, to keep up the elusive offense that the nation has learned to enjoy watching. The offensive line isn’t as strong, so that presents a huge question mark . Last season, TCU had a weak linebacking core, but now it’s their strength along with their defense. Who knows what they may bring to the table, but if they live up to expectation, along with an offense that’s scored 40-plus points in the previous two years this team can be a huge threat to win the Big 12. Probably the only team that has a pretty obvious shot to knock off the number one team. Speaking of that, finally, who’s the number one team in the Big 12 this year? It’s championship or bust this year for Oklahoma. It would be a huge disappointment for Sooner fans if they aren’t carrying around the crystal ball in January. Heisman trophy candidate Baker Mayfield will be back, along with college football’s best, most diverse running game with Semaje Perine and Joe Mixon standing in the backfield with an also mobile Mayfield. The biggest question surrounding this team will be how to replace Sterling Shepard and many members of the offensive line. 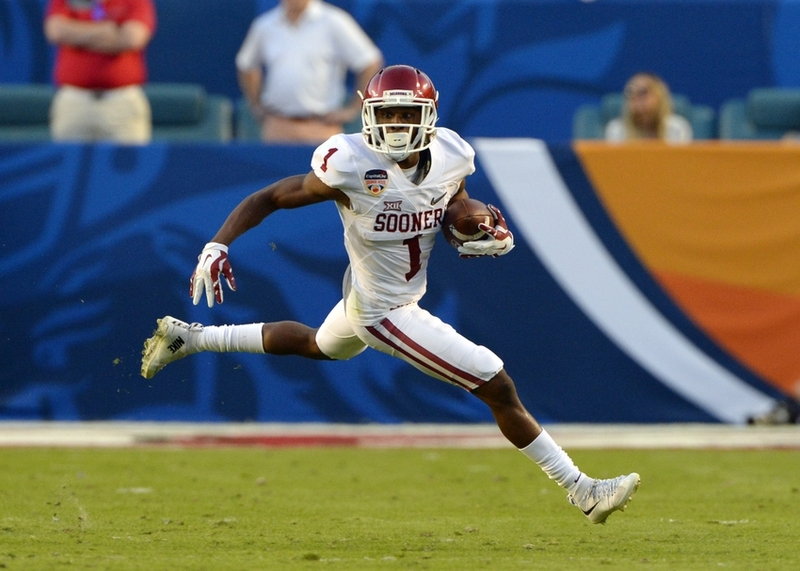 Receiving wise, players like Dede Westbrook will step up to the plate, but who else will? They’ll need one or two more receivers to step up. If not, this team will merely be a running offense, that may not win as much as they’d like. Defensively, there are some questions. Almost their entire starting core graduated and although they still look pretty skilled in the secondary and on the line, the linebackers looks a little iffy. Oklahoma is a team that honestly should go undefeated. There isn’t a team in the Big 12 that should beat them all season when they are at their best, but OU is known for mysteriously dropping one game they shouldn’t drop all season in dramatic fashion, and that’ll probably happen this year as well. However, an (8-1) record will be enough to win the Big 12 comfortably and an (11-1) overall record will get them in the college football playoffs where they should be a serious contender to win a championship. Great, thorough predictions, Suave! I am not as astute about sports like you, but I know good writing and reasoning when I see it. Kudos to an outstanding young up-and-coming superb writer!